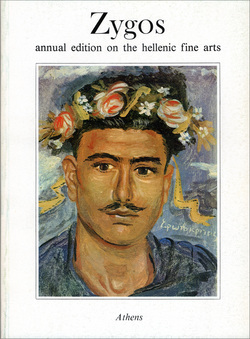 Cover of a promotional brochure for the Zygos Annual Edition by world-renowned Greek artist Alekos Fassianos. 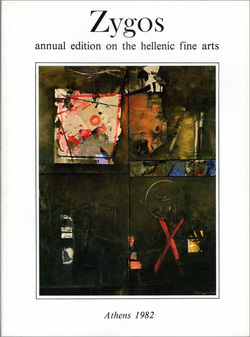 A rare reference source on Greek contemporary fine arts and culture, Zygos Annual Edition on the Hellenic Fine Arts was published in English by Zygos, and edited by Ion Frantzeskakis, between the years 1982 and 1985. Lushly illustrated, each of the four volumes covers the whole spectrum of painting, sculpture, engraving, the applied arts, but also highlights on archaeology, ethnology, folklore, architecture, decorative arts, photography, etc. 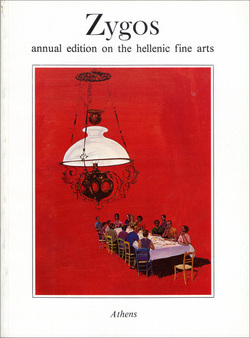 and includes essays by some of Greece's most authoritative art historians, critics, museum directors, and professors, translated into English by a team of experts. 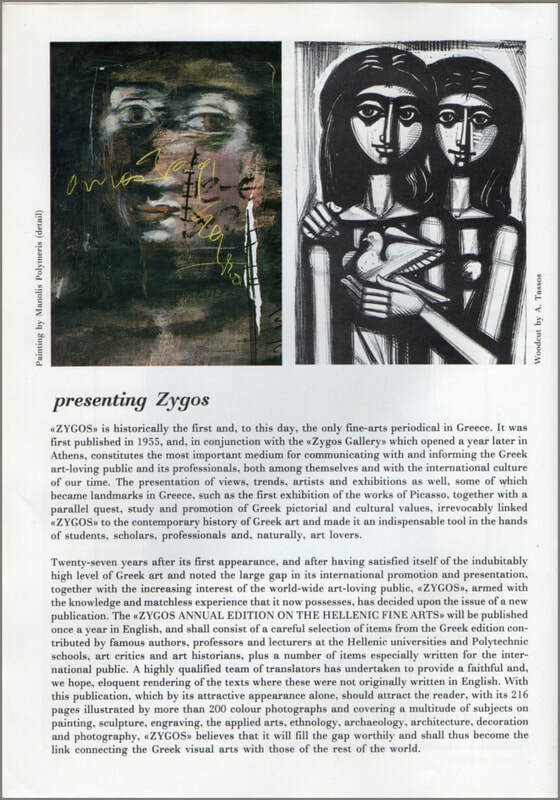 Zygos Annual Edition aimed to overcome the language barrier and to introduce contemporary Greek art and culture to the international art world by breaking down the language barrier which had hitherto hampered communication between Greek and international art circles. The publication received extremely favorable response worldwide and old copies are still being offered by booksellers and book antiquarians throughout the world. 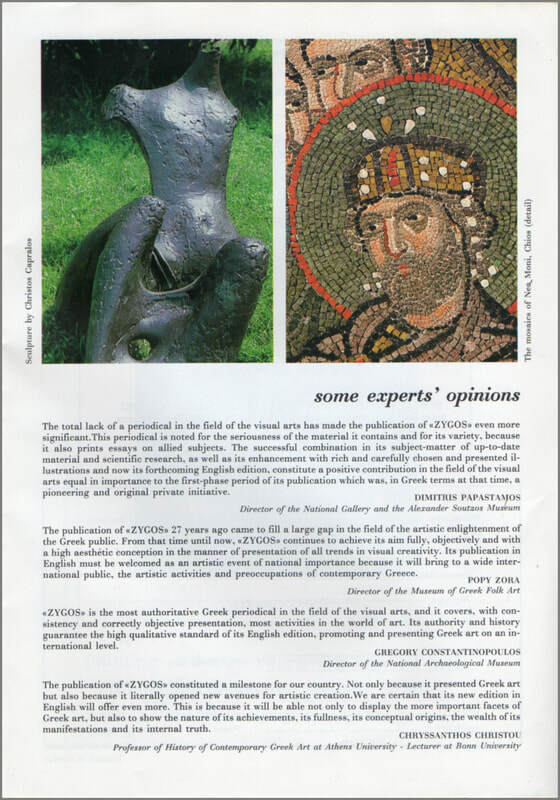 "Zygos" is the most authoritative Greek periodical in the field of the visual arts, and it covers, with consistency and correctly objective presentation, most activities in the world of art. 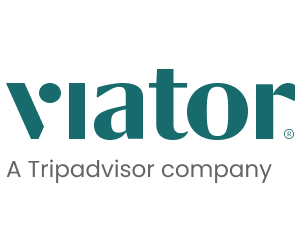 Its authority and history guarantee the high qualitative standard of its English edition, promoting and presenting Greek art on an international level. Renowned architect Iason Rizos at the presentation of Zygos Annual Vol. I, in 1982. 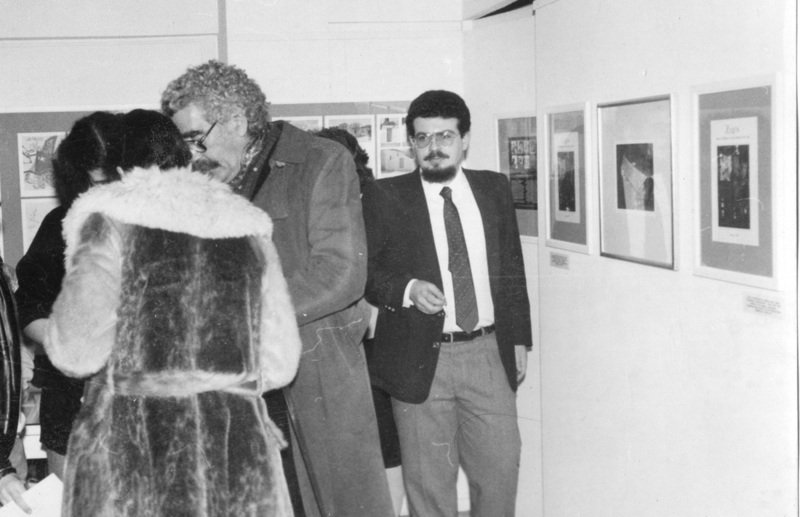 Painter Yorgos Tsiouris talking with Ion Frantzeskakis, and painter and stage-designer, the late Tassos Zografos. Exemplary is the word to describe the English edition of Zygos on the Hellenic Fine Arts - and I mean exemplary by international standards. 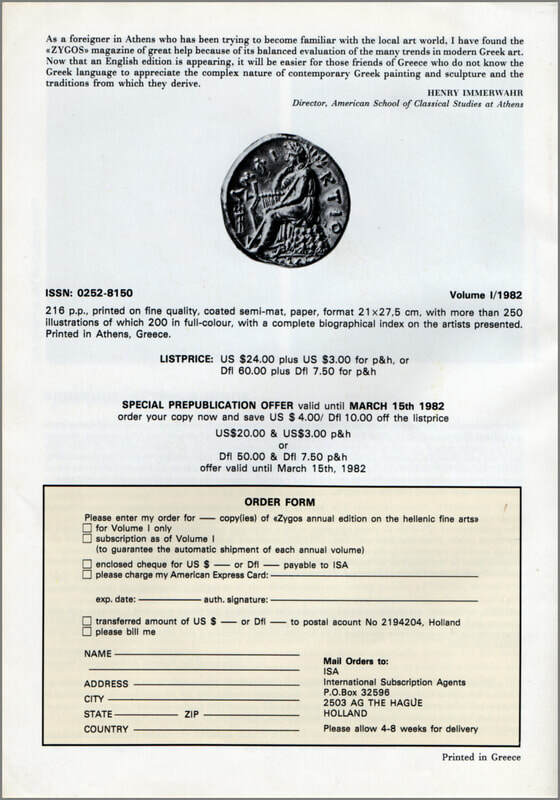 This deluxe edition draws Greek art and its creators to the attention of the world, and not only of the Greeks. Both the production and the contents are of an extremely high standard, and the book fills a deeply-felt need by encouraging foreign artlovers to look beyond our past and see what is happening here in the present. 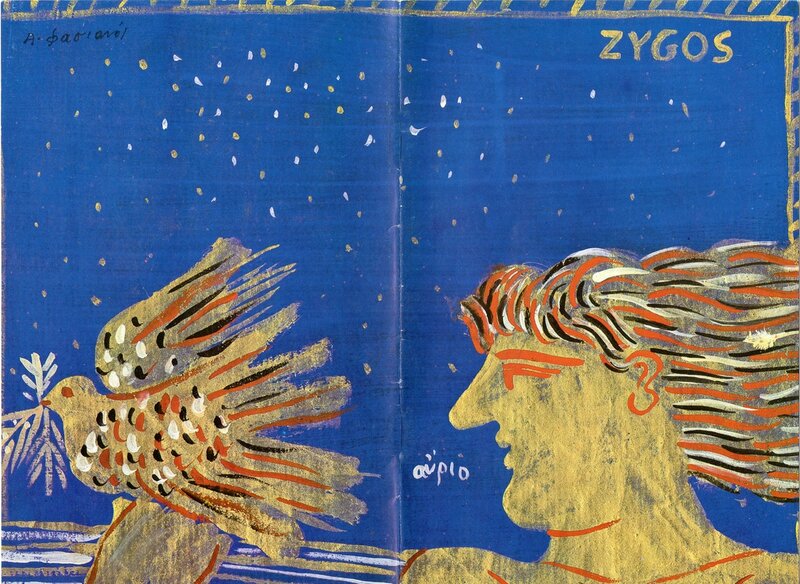 The publication of "Zygos" 27 years ago came to fill a large gap in the field of the artistic enlightenment of the Greek public. From that time until now, Zygos continues to achieve its aim fully, objectively and with a high aesthetic conception in the manner of presentation of all trends in visual creativity. 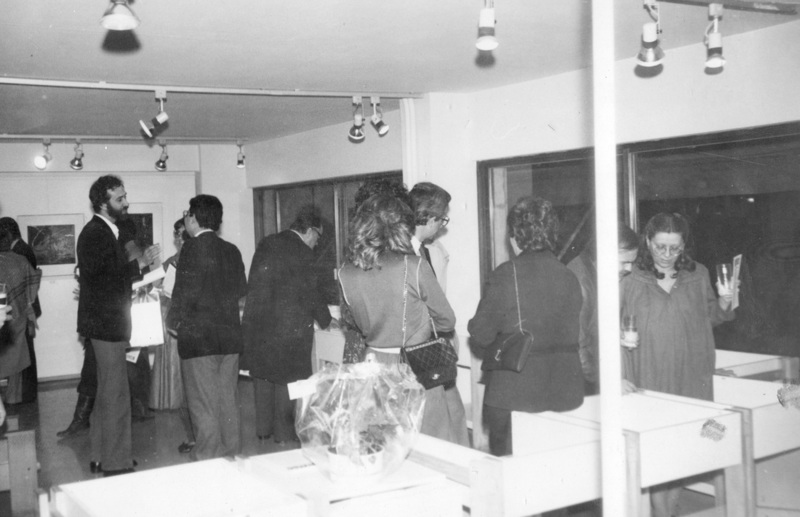 Its publication in English must be welcomed as an artistic event of national importance because it will bring to a wide international public, the artistic activities and preoccupations of contemporary Greece. 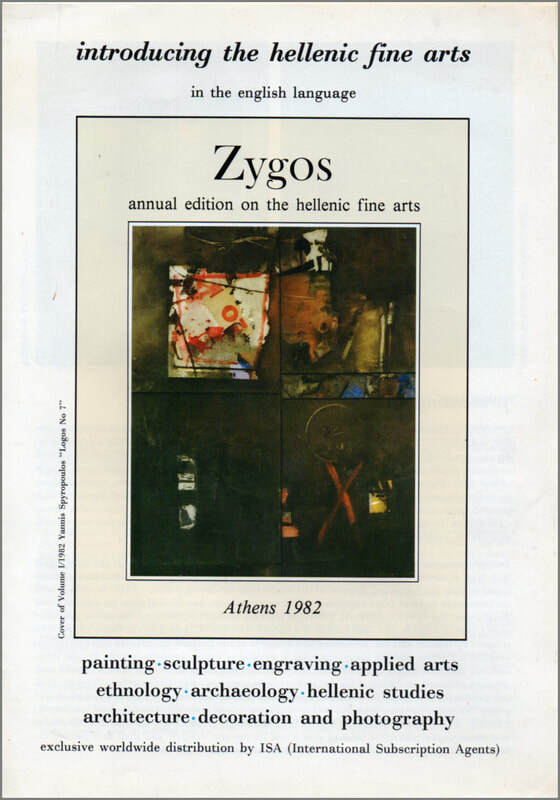 As a foreigner in Athens who has been trying to become familiar with the local art world, I have found the "Zygos" magazine of great help because of its balanced evaluation of the many trends in modern Greek art. 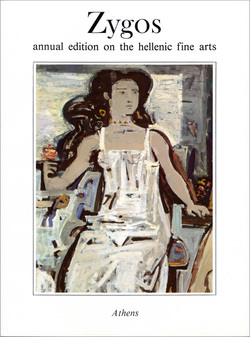 Now that an English edition is appearing, it will be easier for those friends of Greece who do not know the Greek language to appreciate the complex nature of contemporary Greek painting and sculpture and the traditions from which they derive. as well as subjects on Ethnology, Archaeology, Hellenic Studies, Architecture, Decoration and Applied Arts in 216 fully illustrated pages. as well as subjects on Ethnology, Archaeology, Hellenic Studies, Architecture, Decoration and Applied Arts in 220 fully illustrated pages. as well as subjects on Ethnology, Archaeology, Hellenic Studies, Architecture, Decoration and Applied Arts in 224 fully illustrated pages. as well as subjects on Ethnology, Archaeology, Hellenic Studies, Architecture, Decoration and Applied Arts in 232 fully illustrated pages.